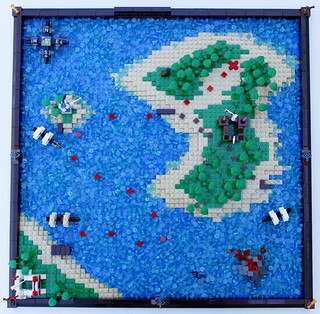 For the Jolly Roger Contest 3 1/2 over at ForbiddenCove.com WE had to build a Pirate Treasure Map out of LEGO bricks. Outstanding job! The colors really pop. Nice one, man! It looks great! Very cool concept, and great execution! Thanks guys! Funny how it just got all these comments 3 months after I posted it. I seemed to have missed this as well, so sorry about that. Great work on this Sir Valiant, very clean and well executed.